Master Minded is among 24 entries for the Grade One Seasons Holidays Queen Mother Champion Chase and aiming to become only the second horse to win the £320,000 two-mile championship three times, following Badsworth Boy in the 1980s. The seven-year-old is one of five entries for champion Jump trainer Paul Nicholls along with Free World, I’msingingtheblues, Takeroc and Twist Magic. A strong Irish entry of seven includes the 2009 Irish Independent Arkle Trophy victor Forpadydepasterer as well as Big Zeb, who was travelling well when falling four out last year, the 2006 victor Newmill and Tranquil Sea, already a winner at Cheltenham this season following his victory in the Paddy Power Gold Cup on November 14. The smart novice chaser Sizing Europe has also been given an entry. Well Chief, the 2004 Irish Independent Arkle Trophy victor and twice runner-up in the Seasons Holidays Queen Mother Champion Chase, has been entered by David Pipe. Voy Por Ustedes is no stranger to Festival glory having captured both the 2006 Irish Independent Arkle Trophy and the 2007 Seasons Holidays Queen Mother Champion Chase. Alan King’s charge has been entered once more for the latter contest and is also one of 43 entries for the Grade One Ryanair Chase, in which he finished second last year as the odds-on favourite. The Sir Robert Ogden-owned nine-year-old was sixth on his latest start in the Grade One Lexus Chase over three miles at Leopardstown on December 29. King is yet to decide whether his charge will contest the two-mile Seasons Holidays Queen Mother Champion Chase or the Ryanair Chase, staged over an extra five furlongs and worth a record £250,000 in 2010. The Barbury Castle trainer revealed today: “Voy Por Ustedes came back A-one from his run in Ireland and in all likelihood will go to the Game Spirit Chase (two miles & a furlong) at Newbury next month. We will have a look at our options based on what he does there. 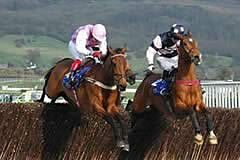 King has also entered Oh Crick in the Seasons Holidays Queen Mother Champion Chase. The seven-year-old triumphed in the Grade Three Johnny Henderson Grand Annual Chase at The Festival in March and added a further big-race success in the Grade Three Red Rum Handicap Chase at Aintree the following month. 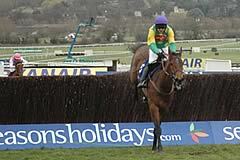 Also among the 43 entries for the Ryanair Chase are the Queen’s Barbers Shop, the 2008 RSA Chase victor Albertas Run and Poquelin, successful over the course and distance in the Boylepsorts.com Gold Cup last month. Class 1, Grade 1, 2m, £320,000 Total Prize Fund. 3.20pm, Cheltenham, Wednesday, March 17, 2010. For 5yo+ which are allotted a rating of 130 or more by the BHA Head of Handicapping following a review of the horses entered and after taking account of races run up to and including March 10 - horses which are not qualified for a rating in GB, IRE or FR may also be entered & such horses may be eligible providing the Handicapper is satisfied that the horse’s racecourse performances up to and including March 10 would merit a minimum rating of 130 (the decision of the BHA Head of Handicapping shall be final). Weights: 11st 10lb. Allowances: mares 7lb. Entries closed January 12, entries revealed January 14 (24 entries), scratchings deadline February 16, £16,000 supplementary entry stage & six-day confirmation stage March 11. Final 48-hour declaration stage, 10am, March 15. Form figures supplied by Weatherbys and are correct up to and including the racing of Tuesday, January 12.